Short term health has about as many uses to people as there are people looking for it! Some generally just need a few months (maybe even days) to get to new coverage. Others can't afford ACA plans but don't want to risk owing a hospital all their assets. Whatever the need, it's very popular right now! That's only going to continue with the uncertainty surrounding the individual/family market. Let's add it all the people moving around a jobs in a hot (finally, right??) job market. Ummm...I'll use that $800/month for rent and food please! Both terms mean the same thing. And, these days there are only a few legitimate options. We'll touch base on everything you need to know. How long can we get short term for? Can the rates differ depending on where I buy short term? Can we cancel short term month to month? Wow...that's a laundry list of short term nonsense. 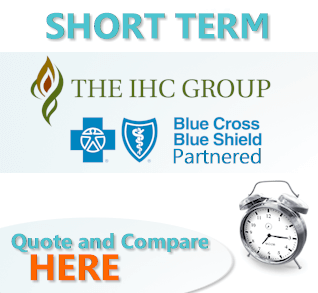 Short term health insurance is coverage needed to cover a defined and usually shorter period of time. I know...that's sounds like not much help at all. We'll get into the key points. The main difference is the "defined period of time" part. It might be 30 days. 3 month. Maybe even 364 days. But at some point, the plan will end. You may be able to re-apply for another block of short term but it does require re-applying. Short term works well when we're trying to get to new coverage. This is why it's usually called "bridge coverage" or "gap health coverage". A period of time we need to cover. Keep in mind that if you're health changes, you may not be able to re-qualify for another block of short term. That's one of the drawbacks if you need health insurance for longer periods of time. So...how long can we have short term coverage for? How long can we get short term health insurance for? Obama passed a requirement that made 3 months the maximum amount of time short term coverage could be sold for. There's currently movement in Washington to extend it to 364 days. This is mainly for the people who can't afford ACA coverage without a subsidy. IHC (partners with Anthem Blue Cross) had a new option where you can pre-buy 2 blocks of 3 months for a total potential coverage of 180 days. You can still cancel every 30 days but this gives you more flexibility on the back end. The 364 days would be great since it will take everyone out to Open Enrollment for either group plans or ACA coverage (Obamacare) which is Jan 1st of every year. 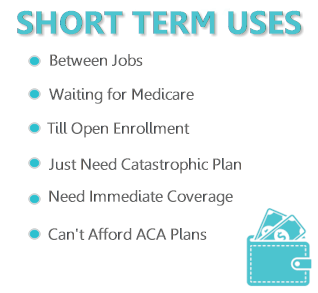 Speaking of which, how is short term different from permanent or ACA coverage? How is short term health insurance different from permanent or ACA health plans? In a few key ways. We've written an entire article on how short term is different from Obamacare here. If you're eligible for a tax credit based on income and you can enroll (Special enrollment trigger or Open Enrollment), you should definitely go with ACA plans. Especially with a tax credit. Secondly, if you have major health care needs including RX and can enroll, ACA will probably make more sense even at a higher cost. Again, we're happy to help with this calculation. There's no cost for our assistance with either short term or ACA health plans! People generally want short term for a specific purpose...to cover a period of time. It works well for that in many cases. How fast can short term health coverage start? We can usually get midnight following online enrollment. It may take a few days to process out but the effective date will be locked in based on enrollment submission. You can also pick a date into the future as well. Can the rates differ depending on where I buy from? Are these the best short term rates? The rates are the same regardless of whether you go through us or any other venue (on or offline). This is true for all health insurance really. 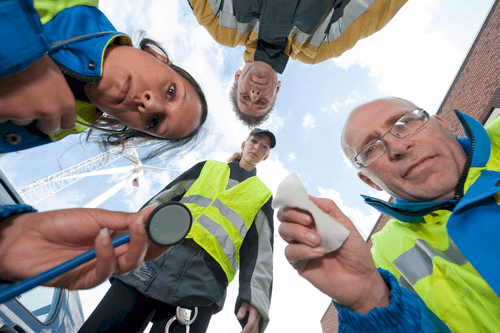 Can I be declined coverage with short term health insurance? 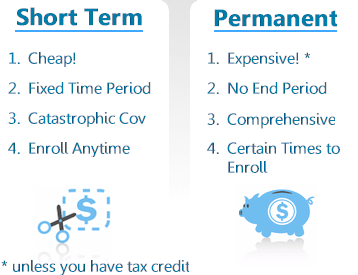 Short term health plans have a simplified application. This means that they're not too involved but there is a series of health questions. Generally, if you answer "yes" to one of the health questions, the application will not be approved. The questions are pretty serious and vast majority of enrollee are able to qualify. One note...there is also an interim health sharing plan which doesn't decline people. You can quote AlieraCare's interim health sharing option here. Before 9/1/2018, the best we could do is 180 days (2 blocks of 3 months) through IHC. Washington is working on extending the short term plans to 364 days (not quite a year) for people who get caught outside of open enrollment. This would be very helpful and we expect to hear word on this any day. The 180 days is the current max that we have. The AlieraCare health share plan does not have the time restriction. (info here). The minimum amount we can get is 30 days. We can cancel every 30 days. Just email the request to the carrier to cancel about 2 weeks prior to the end of the current period. This way you don't have to wait for a refund. Technically, you can request the cancellation all the way till the day prior to next 30 day period but earlier is better. It's pretty slim these days. Many of the carriers use to offer short term but that went away with the ACA law. Now, there are really two legitimate carriers that offer it and you may only have one available in your area. Again, they are not both available everywhere. Be careful with some of the other "plan" out there. If there's a per-night hospital max benefit, run, don't walk! Also, if the backend protection isn't 100's of 1000's, it's a bad sign. IHC and UnitedHealthOne are the only real short term plans that don't have significant design issues. It may come down to what's available to you in your area. In many places, IHC is the only game in town. If you have both UnitedHealthOne and IHC, pricing being comparable, we would go with UnitedHealthOne. Get an update on the best short term health insurance plan for 2018. Again, it may not be a choice. It's best to think of short term health plans as catastrophic type coverage. They're really designed for the big bill! And they do a good job with that. The short term plans function like we used to have 10 years ago. Choice of deductible and everything applies to the deductible. This means that is really isn't designed for your first dollar expenses. Again, as long as you know going in that temporary plans are there for the big bill, you'll be fine. Take a look at the brochure through the quote for more detail on what's covered. That's one big difference with ACA or group health plans. There's no need open enrollment period or need for special enrollment triggers (loss of qualified coverage, marriage, birth, or move are the main ones). We get a lot of interest from people who had their coverage cancelled and now need to wait for open enrollment to come back around. Short term may be the only option available in that case. The standard ACA plans can only be enrolled in during open enrollment (end of year) or if you have a special enrollment trigger. 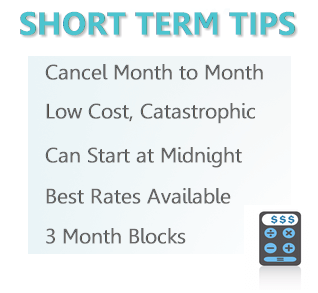 Generally, short term is more for catastrophic or bigger bills. Office visits may be covered but subject to the main deductible. Since the deductibles are generally higher, it's not really meant for office visits. RX on an outpatient basis may not be covered at all. In-patient RX is generally covered as befits the goal of short term. Keep in mind that you can quickly hit 10's of $1000's in one night at a hospital! THAT is why we get short term. Short term plans generally do not cover pre-existing conditions. A pre-existing condition is one for which you have already received treatment or had symptoms. If you have a claim on a short term plan, the carrier will check to see if it was related to a pre-existing condition. Make sure to answer the health questions on the application correctly. Short term is tricky for reviews. We are one of the largest agents for short term health coverage. Of the 1000's of policies we have written, we can only think of one time where some extra effort was needed with a claim. Basically, it was a coding issue from the doctor at the hospital. Some of the online reviews can be really negative but that doesn't match our experience. Knock on wood, we'll never have to use the policy since it's for short period of times. Most people, get short term coverage. Cover the period of time. And there off to other health insurance. No reason to leave a review since they didn't really interact with the policy. This tends to skew any online reviews to people who are really upset with their interaction. 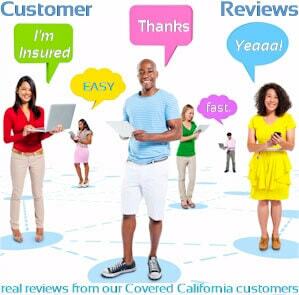 Think of it this way...if your health insurance carrier pays a claim perfectly, do you feel the need to leave a review?? It's health insurance...not your favorite restaurant. No one LOVES health insurance! As one of the largest writers of short term health, we can only give our review. The carriers act and pay as expected. If they didn't, the premium would be much lower! United is the biggest carrier in the US and IHC partners with Anthem Blue Cross. You can find our short term health carrier and plan review here. They may also be the only game in town for temporary coverage! The penalty is slated to go away in 2019 but for 2018, beyond a 3 month gap in ACA coverage, you may face the penalty depending on income. Creditable coverage means that a health plan meets the ACA (Obamacare) requirements for coverage. Short term does not meets these requirements. The main effect of this is that you may face the penalty in 2018 for not having coverage. This penalty is slated to go away in 2019. The reasons are as varied as the people who need coverage. Either way, short term is generally a good fix for the underlying need. Unless your company gives you some type of severance where coverage is paid for. This does happen but is not common. For the rest of us, group coverage typically ends at the end of the month in which our employment ends. If you are terminated on the 1st of the month, your coverage may end on that day. Either way, most people are offered a Cobra option which allows them to continue the group plan but pay the premium. That premium can be very high! This is why many people compare short term health coverage with Cobra. Especially if they think they might get other coverage fairly shortly. You should also investigate ACA plans versus Cobra. We're happy to help with this comparison. There's no cost for our assistance either way. Many people get temporary or gap coverage between jobs. Usually, a person's group coverage (Employer based) ends when leave one company. It's also typical to have a waiting period for new employment. This generally runs from 1 to 3 months. Short term can a very effective way to handle this gap in coverage between jobs. If you have serious or ongoing health issues, make sure to compare Cobra (continuation of the first company's group health plan). Short term plans do not cover pre-existing conditions. Most people are offered Cobra when they leave a company and its group health plan. Cobra is continuation of the group health plan when you lose it. It generally comes down to cost and health. Cobra can be very expensive. Short term is more for catastrophic and emergency situations. We're happy to compare these option with you at 800-320-6269 or by email. This is a whole other calculation! Obamacare plans share many of the traits with Cobra up above. Which makes sense since most Cobra (group) plans are ACA compliant. The big different is the potential of tax credits based on income! Make sure to enter in your income and size of household (everyone that files together on a 1040 tax form). See if you can get a tax credit! If so, ACA is probably the way to go. Also, if you have healthcare expenses and needs, the higher cost of ACA plans might still make more sense versus short term. Short term will not cover pre-existing conditions and is more for catastrophic coverage. Covered California IS Obamacare in California. The State created their own marketplace. Most of the same rules apply. Also, most of the same calculations mentioned above in the Short term versus ACA. More detail on Covered Ca versus short term here. The process generally takes a few days and coverage can start as early as midnight following online enrollment. These are the best rates available and the strongest carriers available. Please call 800-320-6269 or email with any questions. Short term is sold in blocks of 30 days. The quoting system may show 90 days but that just means that you can renew up to 3 blocks of 30 days. In fact, there are new options to get two blocks of 3 months. Potentially, that's 180 days without having to re-apply. You can still cancel before any next 30 day block starts with an emailed request to the carrier. Our services are 100% free to you as licensed health insurance agents. Health insurance (including short term) is funny that way. The rates are standardized so you can be sure these are the absolute best rates for each carrier. How do I quote short term health insurance? If you have any questions or issues with the quote or plan selection, please let us know. How do I apply for short term health insurance? If you run into any questions on the application, please let us know. That's doesn't mean we've answered every questions! Call us at 800-320-6269 or email us with your questions. We can help with the plan selection as well. Short term have become a very handy way to cover gaps in coverage. This will continue as the rates keep going up on the standard plans. Get help in other States on the new Trump expanded short term health insurance. Quote Temporary health plans to view rates and plans side by side for both carriers...Free.